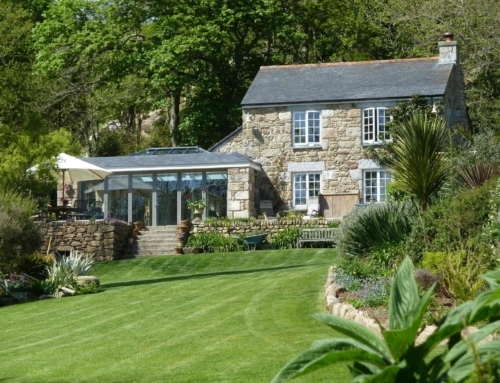 Quay house is situated at the head of a sharp curve in a winding river near St. Mawes. The previous dwelling had been formed in a clearing in the densely wooded area forming a bank to the water commanding strategic views both up and down river around the bend. The site is accessed across three plateaued meadow fields before descending steeply and sharply to a ledge nestled with its back against the hard rock that forms the topography. Descending further brings you to an existing Cornish granite formed Quay with two sets of granite steps providing the physical connection to the water. Over the years the clearing had been tamed into stone terraced gardens and features which focused on particular views out to the river. The design of Quay House sought to respond to the steep topography, existing built features and focused views whilst providing the client with 4 Bedroomed living accommodation. The river is a resource that should be protected and as such a design was produced that resulted in as minimal detrimental visual impact as possible. The Lower Ground floor is set partially submerged into the ground which dictated the layout and location of the main living spaces on this floor. Large corner glazing and openings were incorporated between the use of heavy stone faced ‘pillars’ to portray the submerged nature of the spaces whilst allowing as much light in as feasibly possible. The stone was carefully chosen to tie in with the existing aesthetic of the original loose laid dry stone terrace walling.